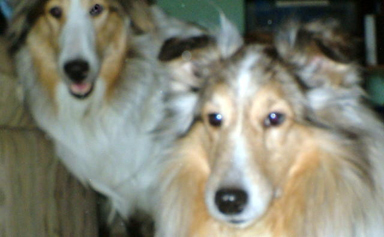 Proud parents of a very unusual group of Sheltie pups born January 24, 2007. You may notice that we are both sable merles. 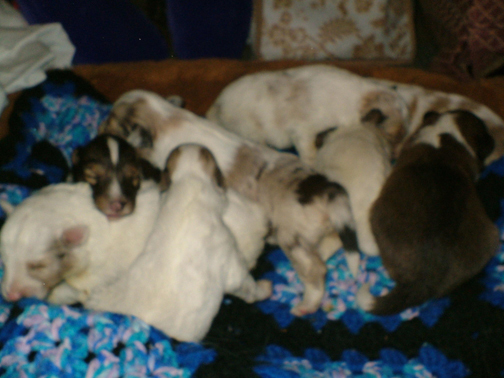 It started with that Sassy and Rory combination, the surprise litter at the end of 2001. 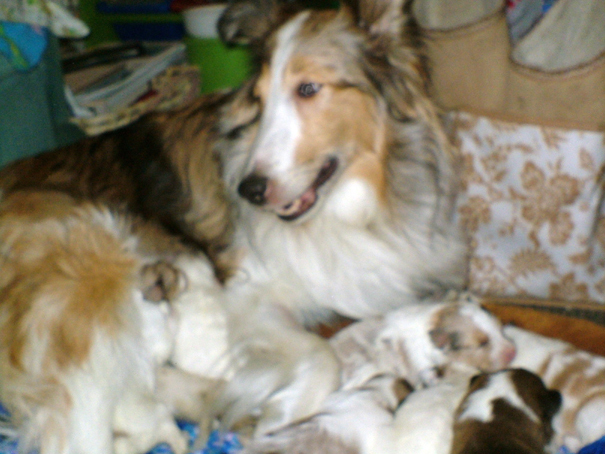 Their pedigree combined so many good things that we repeated the union three times and only got our sable merle in the very last litter at the end of 2003. So Tempest the puppy at the top right looking away from Sassy, is now the lovely adult pictured with Flicker, Sassy's daughter from her 2004 litter by that special visitor from Japan Ch.Rising Dragon of Hitachi Farm. 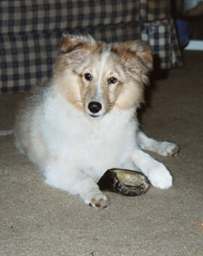 Yes, it was another sable breeding for our blue merle girl and this time we got lots of sable merles including Flicker who is pictured as a pup and also growing up at the bottom of the page. 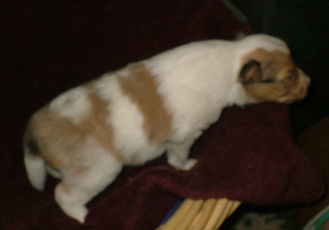 So in 2005 she had a very proper litter by Vader our special tricolor son of Ch.Virgo Tommy Tune. And these were proper boys and girls including a lovely bi blue girl and a handsome tricolor boy who grew up to be a lot like his father as you will note at the bottom of Vader's page. But We Decided to be Different! Yes, you counted correctly, we are eight bouncing babies. And you also noticed that we are very colorful! Flicker is a wonderful mother. And we are already starting to wriggle about at one week. So we are six girls and two boys. 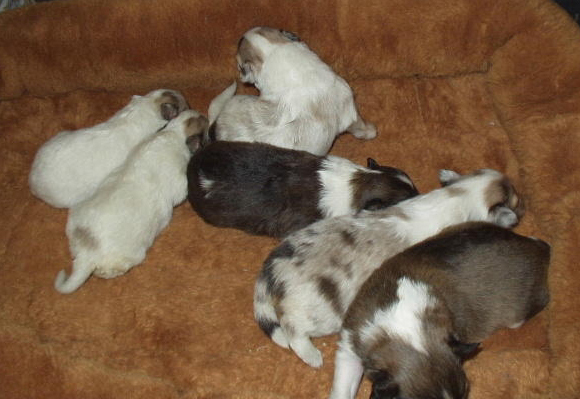 The colors are still developing, but at this point we seem to be, two sable and white girls, two color headed white with sable merle girls, a very white factored sable merle girl and a sable merle girl. 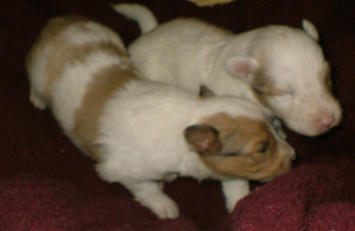 One boy is a light sable with lots of white and his brother is almost all white with a touch of blue (a double merle). You see our parents are both white factored as well as both merles. That certainly makes us a very colorful crew. 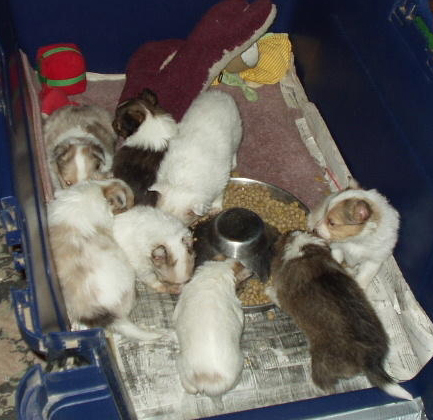 The six girls from left to right are - Sugar the smallest sable merle headed white, Smudge another small sable merle headed white, Cameo the white factored sable merle, Nutmeg a sable and white, Sprinkles the sable merle and Cinnamon another sable and white. Aren't we a kitchen crew? 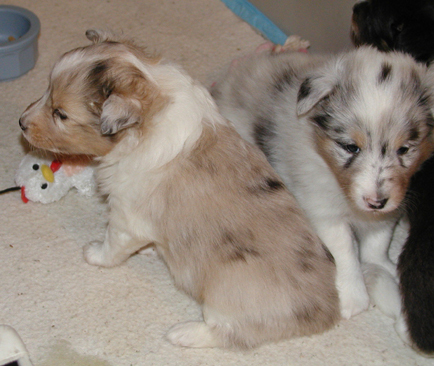 The two boys are named Rocky who is a white factored light sable and Radar who is a double merle. Rocky thinks he stands out. Now we are big enough to eat real food. And we look out at a bigger world. 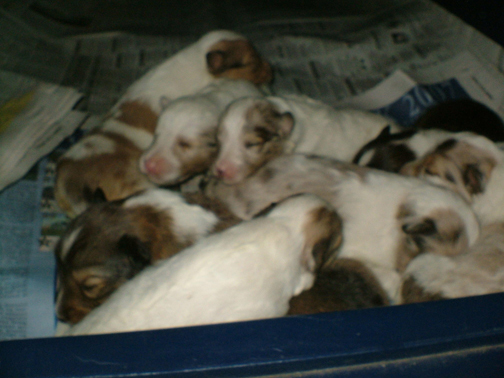 That's Cameo and Nutmeg in the back and Cinnamon, Sugar, Smudge, Radar and Rocky in the front. 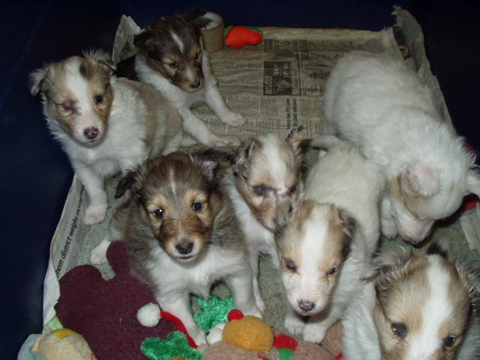 Do you recognize (left to right) Cameo, Nutmeg, Sugar, Cinnamon, Springkes, Smudge and Rocky's nose? Keep checking as we grow. Many of us are in our forever homes. Don't you think Nutmeg is pretty? 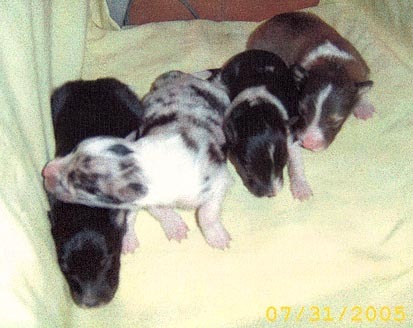 In the beginning you can see the merle although you also note the sable shade instead of the grey in the blue merle brother. But at almost nine months you would think I was a lovely sable boy. 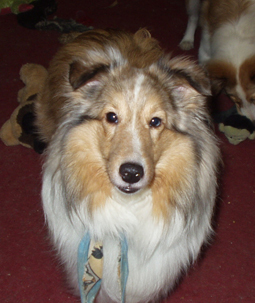 And here I am the adult sable merle you saw at the beginning. The merle is back as silver tips which make me glisten. So I carry on the Sassy legacy in many ways including the merle disguised behind my sable sheen.